Lovely comfortable villa with fabulous new BBQ patio area. Your dream holiday. This villa offers good spacious, light and airy accommodation for 4 people. It has one double bedroom with en-suite bathroom and one large bedroom with 2 single beds plus a guest shower room. The spacious kitchen has seating and is amply stocked with appliances and utensils.The villa has outside sunny areas for breakfast, evening drinks and relaxation. A large BBQ area fully equipped for your alfresco culinary skills! Sea views and ideally located to take advantage of all the facilities in Ribeira Brava. Good central location for exploring the island by car, bus or levada walking. Good shops, transport and road links to rest of island. house in an awesome island. We were so happy to live a moment here. for the beauty of the garden.
. Un agrèable séjour inoubliable. We love to travel and spend the summer months sailing or visiting family. We return to Madeira in the winter. We are delighted to host you in our Villa during the summer months. O Retiro offers you a spacious villa where you can relax indoors and especially in our outdoor entertainment areas. No matter your preference - sun or shade - you will find a great place to sit while you enjoy your outdoor meal, or your sun downer and watch the sun set. The beach in Ribiera Brava is a 10-15 minute drive away. Walking is about 20 minutes down hill. Internet with WIFI access throughout the house. A comfortable living room with a small balcony and sea views. Fully equipped with Hob, Oven, Microwave, Dishwasher, Dining Island, sink, kettle, fridge. Dining table and seating for 4 people within the lounge area. Personalised fishing trips can be arranged during your stay. Request contact details and state you are a guest at 'O Retiro'. The villa was spacious, clean and well furnished. We enjoyed having so many options of where to sit and eat. Location was good for travelling around the island. There wasn't alot of information available in the villa and the Tourist Information Office in Funchal were useless so we had to find our own way around. Apat from that we would recommend it. Would be interested to know what equipment was not in the kitchen as it is fairly comprehensive for a holiday let and the same as a number of properties we look after.. It would have been good to have been told whilst they were here as we could have resolved this matter if we had known. The gardener has now changed the watering timing. Again if they had said it could have been addressed at the time. Dogs are unfortunately a Madeiran problem in many areas. We are very happy we choose O Retiro for our holidays in Madeira. The cottage was very cosy, pretty and clean, just like the pictures show. The effect upon arrival was even above our expectations. Beautiful flowers in the very welcoming garden, view on the sea in the distance, banana trees surrounding a part of the house, comfortable and good taste furniture... 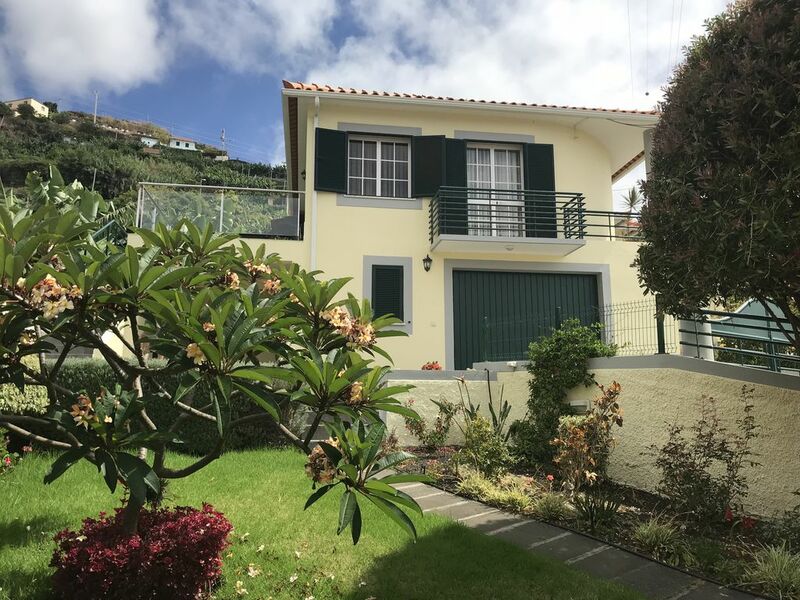 This is a peaceful location on the hills of Ribeira Brava. Thank you Colin for your welcome. Madeira is so astonishing and attractive. We did not make all of it in one week. We want to go back soon and if we have this opportunity, we will definitely choose charming O Retiro if available ! Sehr schönes, gepflegtes und hervorragend ausgestattetes Ferienhaus. Beim nächsten Madeira Besuch gerne wieder! Wir haben den Urlaub sehr genossen. Das sehr gepflegte Haus bietet alle Voraussetzungen für einen gelungenen Urlaub: wirklich gute Lage in einer (teilweisen) ruhigen Villengegend.Sehr gute Ausstattung, wenn auch die Küchen- und Tafelmesser der Schärfung bedürfen. Sie bietet für 4 Peronen ausreichend Platz und auf der BBC-Terasse angrenzend an den sehr gepflegten Garten könnte man schöne Parties feiern. Was fehlte war ein Tisch auf der obersten Terrasse, damit man im Freien Essen kann. Das Haus liegt an einer sehr steilen Stichstraße, bietet aber einen herrlichen Ausblick und ist ein idealer Ausgangspnkt für alle Ausflüge. Leider war der direkte Weg nicht befahrbar, da ein Bergrutsch die direkte Zugangsstraße stark beschädigt hat. Folge war ein etwas größerer aber auch genussvollerer Umweg. Was uns sehr gestört hat, war fürchterliche Lärmbelastung - insbesondere in den frühen Morgenstunden und am Abend, teils sogar nachts, durch die Hunde in den benachbarten Grundstücken. Beim Nachbarn links waren zwei Hunde, die bei jedem vorbeigehenden ein Konzert von mehreren Minuten anstimmten. Am Abend kamen dann noch die Hund von Rechts (5 auf einem Grundstück) hinzu, die sich dann Duelle mit denen von links aufführten. Es war wirklich störend. Wir haben den Aufenthalt in dem wunderschönen Haus sehr genossen!! Es war perfekt eingerichtet und es fehlte nichts. Alle Fotos entsprachen der Realität(auch der Meerblick) Besonders der gepflegte Garten mit den schönen Blumen hat uns sehr beeindruckt. Wir bedanken uns ganz herzlich für die liebevoll eingerichtete Wohnung ,in der wir uns sehr wohl gefühlt haben!